Our Free Comic Book Day coverage continues with another slew of free comic book reviews. You can read part one here or just dive straight into the action, windmilling your arms and punching with reckless abandon. 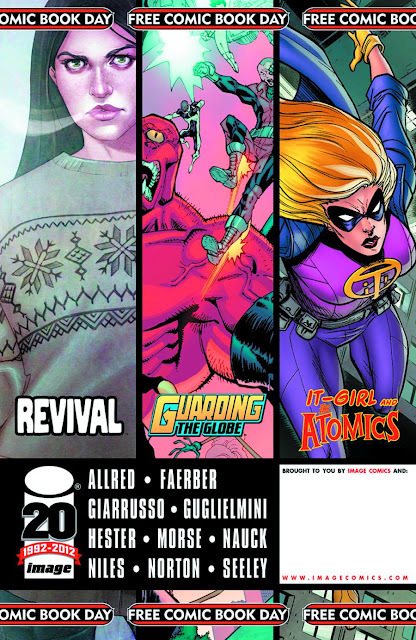 This time I’m looking at Mouse Guard, Image Comics, Atomic Robo, and this month’s buzzword: Avengers. How do they shape up? Do they even make any sense? Find out all this and more... after the jump! It’s a little sad that I’ve become so jaded by modern superhero comics that my gauge for whether a book is “good” is whether or not it is coherent. For FCBD Marvel appear to have done much better than DC in this regard. 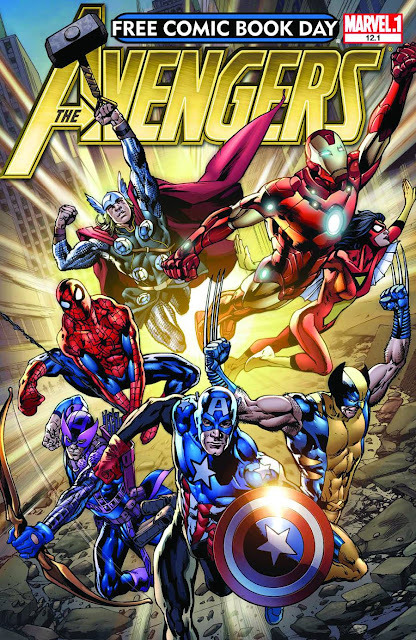 Although Age of Ultron teases a far larger narrative, this free book has a relatively self-contained and easy to follow story, even though you may not know who everyone is. If the film has made you think of The Avengers as a six member team then you may be overwhelmed by the fact that the Avengers pictured here have about a thousand members (all crammed into one very sweaty room) including prominent X-Men like Wolverine and Beast. Similarly there about thirty villains in this book (including some obscure classic villains like Red Ghost who had a team of crazy apes) so you never really get the chance to know anyone if you’re a first-timer. But the art is dense and pretty, the dialogue is solid (Spidey has an amusing one-liner that confuses Captain America) (wait, Spidey’s an Avenger too? Who else? Aunt May? Howard the Duck?) overall it was enough to pique my interest. And it’s a generous package (chuckle) for a giveaway. An additional point of interest: There’s an advertisement at the back for the first issue of a new Avengers series which focuses on the line up from the movie. This looks like a far more appealing jump-on point for fans of the film and, truth be told, it’s probably what I’d prefer to be reading. I commend Marvel for at least getting it out there. This hardcover anthology has to be the most beautifully presented free comic book ever. Most comics feel disposable (especially when the shiny paper feels about as appealing as a supermarket catalogue) but this is definitely an object to keep. Knowing this, publisher Archaia has even put a little “This book belongs to.... “ nameplate on the inside front cover. This was definitely a book to grab. 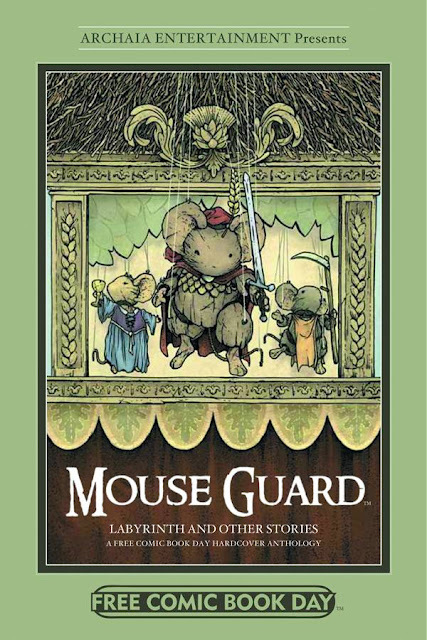 I’ve heard great things about title story Mouse Guard but this was my first time reading it and I’ll admit I was impressed. Artist/writer David Peterson capitalises on the storybook feel by giving us a series of ornate illustrations set to prose. It’s a touching fable with a satisfying payoff and it’s well worth your time. The other highlight for me was the short story set in Jim Henson’s world of Labyrinth. It’s completely self-contained and tells of a comic misunderstanding between a lovelorn Hoggle and the “Allo!” worm. I was also amused by a black and white tale of eccentric piracy. This book is a perfect first does and should contain something that appeals to everyone. Archaia have really raised the bar in terms of format and content and I hope that this book really inspires other publishers to further explore their releases next year. Image also released an anthology (all of them excerpts I believe) although I didn’t find it quite as intriguing. And I do like Image in general - I think they’ve released a diverse range of books of late that should appeal to a number of tastes. Multiple genres are represented here, including: superheroes, humour, crime and horror, but none of them really grabbed me, except for maybe the cartoony adventure at the beginning of the book. I grabbed this one due to Mike Allred’s It Girl and the Atomics being shown on the cover but was disappointed that Allred doesn’t appear to be involved in this current take. Without Allred’s seemingly effortless flair the It Girl stuff fell a little flat for me. It looked like pedestrian superhero fare, devoid of the zany, unpredictable quirk that Allred used to inject. You’ll never hear a bad thing said about Atomic Robo and I’m finally beginning to understand why. Even on the very odd chance that this story isn’t for you, it would be futile to criticise it. The art is tight, the writing is sharp and it’s a wonderful mix of adventure and comedy. 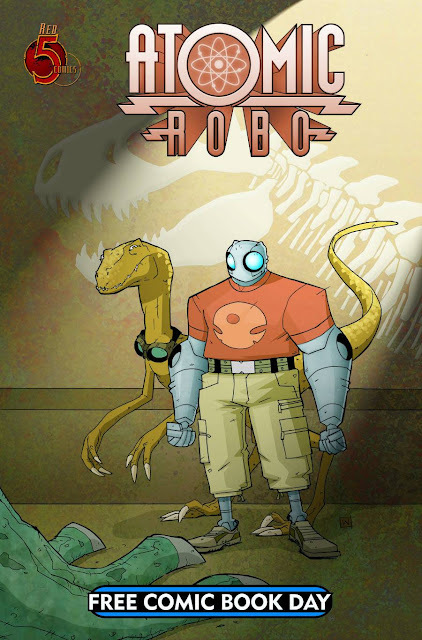 In this issue Atomic Robo teams up with the erratic Dr. Dinosaur to solve an interdimensional problem which results in a deadly, missile-equipped Futuresaurus Rex. My only complaint is that it ended too soon. Atomic Robo is so solid that you really will wonder why it isn’t a hugely popular runaway success. It probably deserves more praise and discussion than the entire DC New 52, but I can’t see this injustice changing in a hurry. I’m guilty of it myself. I really should’ve headed this article with Atomic Robo or Mouse Guard, but know that Avengers has everyone gripped at the moment. The second half of this book is a Neozoic back up story about some folks and some dinosaurs. I found it a little flat after Atomic Robo and it failed to spark my interest. It’s hard to tell with excerpts - maybe it would benefit from a larger read. Overall, I’ve been really impressed with Free Comic Book Day overall. Once you’re willing to push past the DC and Marvel juggernauts, it’s refreshing to discover that there really is a surprisingly diverse amount of material available. Even comics for children! And, to be fair, some of the mainstream superhero stuff is pretty fun too. I really hope that the publishers that put in the extra effort will capture the interest of new readers from FCBD.